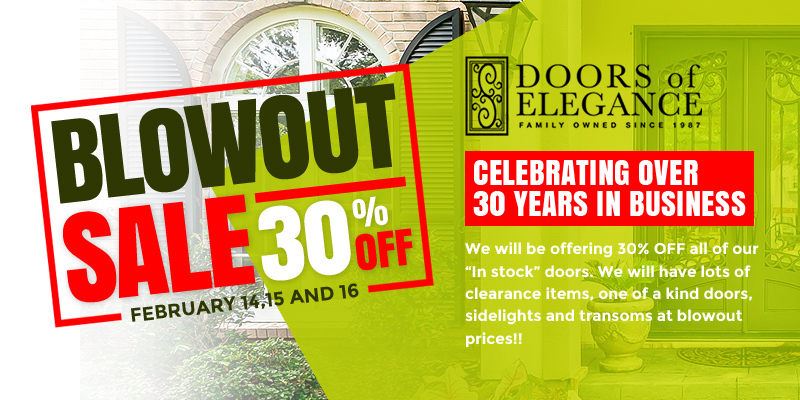 New Orleans Door Blowout Sale Celebrating 30 Years in Business! Has it really been 30 years? They say, time flies when you’re doing what you love and it’s true! Not only are we celebrating our time spent providing the highest quality products and customer service since 1987 but we’re celebrating the amazing people who helped support us through the decades – that’s you! Join the Doors of Elegance team this Valentine’s Day through the weekend, during regular business hours for our ANNIVERSARY BLOWOUT SALE! We’ll be offering 30% off ALL our “In stock” doors. Plus, we’ll have LOTS of clearance items, one of a kind doors, sidelights and transoms at blowout prices!! The Doors of Elegance Team and YOU plus whoever you’d like to bring along! It’s our 30 Year Anniversary and we just can’t help ourselves! In all seriousness, we’re thrilled to be able to celebrate 30 years of dedication to customer service and high-quality products on both sides of the lake, from metro New Orleans to Mandeville and the entire Northshore. If you’re unable to swing by this weekend or if you have a project you’d like us to get started on right away, contact us. We’re looking forward to seeing y’all and again, thank you for your support throughout the years!